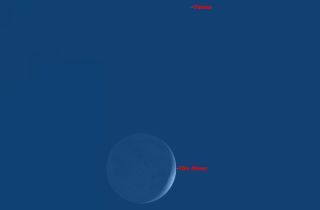 On Saturday, July 18, the moon passes just below the planet Venus, both objects showing narrow crescents. On the evening of Saturday (July 18) the crescent moon, as it moves eastward across the sky, will appear to pass directly below the crescent planet Venus, which itself is moving westward across the sky. Both objects are being lit by the sun in such a way that both appear in our sky as crescents. The moon is just three days past new moon, so only 9 percent of its disk is lit by the sun. The remaining 91 percent is lit by sunlight reflecting off the surface of the Earth, what is called "earthshine"or "earthlight." Sometimes this view is also called "the old moon in the new moon's arms." Because Venus is farther away than the moon, it is lit by the sun at a slightly different angle, so is nineteen percent illuminated, a slightly fatter crescent than the moon. Some observers have suspected a faint glow coming from the part of Venus not in direct sunlight, a phenomenon called "the ashen light. "No one knows exactly what causes this glow, but it has been reported by many experienced astronomers. Spectroscopic observations have shown pulses in the light, so it might be due to lightning in the hot acidic atmosphere of Venus. As mentioned above, even small binoculars provide enough magnification to turn the naked-eye pinpoint of Venus into a visible crescent. This is one of many objects in the sky which are revealed or enhanced in binoculars, which is why they are considered an essential tool for all serious skywatchers. Binoculars for astronomy should have a front aperture of at least 50 millimeters (2 inches). This is seven times the diameter of the fully dark-adapted eye. Such a small binocular has seven times the resolution and 50 times the light-gathering power of the naked eye. A pair of 50-millimeter binoculars come in two magnifications, 7 power (7x50) and 10 power (10x50). Both are very useful for astronomy, but I prefer the 10x50 because of its slightly higher magnification and better contrast in a bright sky. I find more powerful binoculars too heavy to hold steadily for any length of time, and mounting them on a tripod defeats the ease of use.